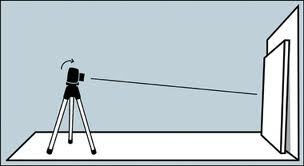 This shooting style - tilting the camera to turn a vertical or horizontal line into a powerful diagonal - has been around for awhile. One term used for it is the "Dutch angle", which is a longtime cinematography; to create visual tension. Still, when I tell clients that it's perfectly acceptable, if not totally desirable, to occasionally slant the camera, they express surprise. After all, your're supposed to keep the camera level at all times, correct? Well, there are exceptions! Used at the right artistic time, a nice tip of the camera can pump up the visual tension by creating exceptional angles and diagonals. Rendering with your camera askew (so as to change naturally appearing vertical or horizontal lines into diagonals) can be done for a variety of small scenes or ambitious views. Like other creative techniques, you won't want to use this method all the time, but when the subject calls for it, angling the camera is one worthy artist weapon.